In this day and age, our lifestyle revolves around convenience. Our day to day lives is based on this. That is where portable massage tables come in. They changed the game for certified therapists and students alike. A substantial part of their livelihood depends on the tables. Being able to get to their client’s has made it easier for both parties. 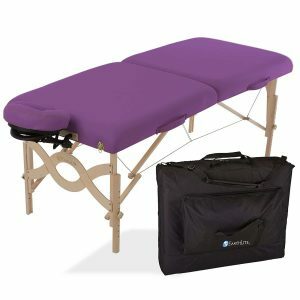 Aside from the professionals, homeowners tend to buy portable massage tables as well. That is why today we are going to have a look, at the best portable massage tables in 2019. Carrying capacity: Each massage table has a weight limit in which it can handle. It is important not to exceed these limits so that you don’t put yourself or your client in harm’s way. The weight of the massage table:​ The main purpose of these tables, is being able to carry them with you. If the massage table is too heavy, you won’t be able to move around with it. How comfortable the table is: In order for one to relax, they need to be comfortable. Make sure you choose a table with the proper padding and design. They are convenient: one can get massages at the location of their choice. They provide income: professionals are able to start their own practices, thanks to these tables. They help one relax: having a massage table will enable you to get massages whenever you want. This comes in handy whenever you are really stressed or fatigued. Using this portable massage table gives the kind of comfort one would get when at the Spa. When it comes to global recognition, EARTHLITE has a renowned reputation. All their massage equipment are nothing short of professional. Other massage tables are far from rivaling this one’s strength. It has an exceptional weight capacity of about 3,200 lbs. If you have a lot of overweight clients, this table is ideal for you. Anyone weighing up to 800lbs can use it comfortably. You won’t have to worry about damaging your chair or their safety. Your purchase will also include 1,000 lb. test aircraft grade steel cables. The cables are used to provide the table with bridge truss strength. The next portable massage table on our review is also from EARTHLITE. I would recommend this one, to people who want a professional tilt massage table. 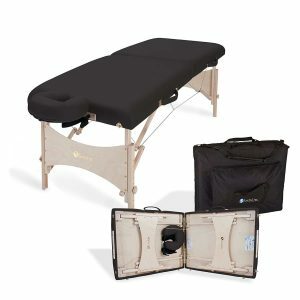 Your purchase will get you; a ballistic nylon professional carry case, a patented Flex-Rest self-adjusting face cradle, the full sized, 30”x73” portable massage table and the proprietary Form-Fit memory cushion. This massage table has a very impressive dual-density cushioning system. The cushioning is very plush and soft at 2 ¾”. It has the perfect balance of responsiveness and supportiveness. This is where EARTHLITE offers you a wide variety of color options. You can get this portable massage chair in; black, amethyst, burgundy, latte, mystic blue, and teal. One of the reasons why it is highly ranked is because of its Patent pending Shimmy-Lok Leg Brace System. This system makes it safer than most massage tables out there. Compared to other aluminum frame designs, it is the most stable one. 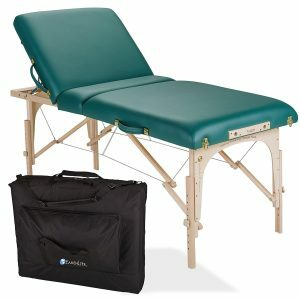 Additionally, the portable massage table also uses a Patented Cradle-Lock cabling system. The system comprises of aircraft grade steel cables of 1000lbs. All these features combined, are what make it a high-quality table. Hearing the massage table squeak while trying to relax, simply doesn’t work. This is the kind of table you need, to avoid such things from happening. EARTHLITE even guarantees you that it is squeak-proof. The table’s construction consists of; North American hard maple legs and braces, a hardwood dowel jointed frame, and hardwood corner blocks. That is why it is very sturdy and stable. You will have an easy time carrying it because it only weighs 34lbs. This is much lighter than other portable massage tables. Your purchase is backed by a 3-year warranty on the foam and upholstery. The frame and the construction, have a Limited Lifetime warranty. 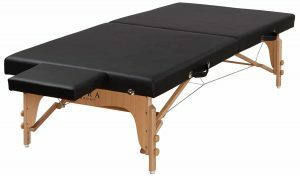 This Sierra Comfort option can also be used as a stretching table. It has been made using PU leather. This type of leather is advantageous because it makes the table durable. It also gives the massage table water and oil resistant capabilities. This ensures that it doesn’t get wet and can readily be re-used. The stitching used on it is very durable and its overall construction consists of hardwood. Your purchase will also include a carry bag and a table extender. The table’s dimensions are; 72-inch Long x 33-inch Wide x 16-24 Height. You will be able to adjust the height as per your current needs. The foam deck is also very comfortable and is about 2 inches. 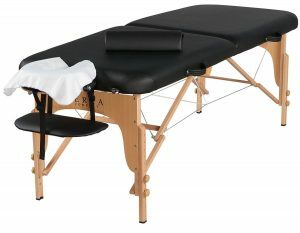 What do you consider to be the ideal massage table? 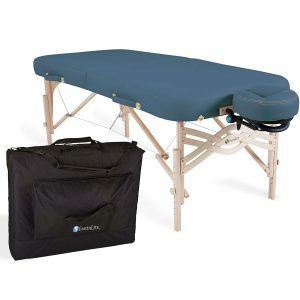 This all in one portable massage table should be able to fit the bill. It has a patented Deluxe Adjustable Face cradle. The face cradle is one of a kind and has a proprietary Cloud fill poly-gel blend face cradle cushion. Finding tables with such qualities doesn’t easily happen. The comfort levels you will experience are amazing. This is also because of the use of Natursoft™ fabric. It has a very soft and supple feel to it. The height of this massage table can be adjusted between 23-32 inches. It has dimensions of approximately 72 by 28 inches (L x W). When folded down, its dimensions are 36 Long x 28 Wide x 7 Thick. Overall, your purchase will get you; disposable face sheets, an adjustable face cradle, an arm shelf, a Semi-circle bolster and a carry bag. The 2.5inch high-density foam used is quite luxurious. Your client’s massage experience will definitely be memorable. The frame is also backed by a 5-year manufacturer warranty. This table has been highly rated and is one of the best-selling ones in the market. Best Massage used high-quality beach timber to make this portable massage table. It was precision crafted and has very strong construction. You are guaranteed to feel relaxed, especially thanks to the Side Armrests. You can adjust the face cradle to whatever way makes you comfortable. Using its standard accessory kit, the massages will be on a different level. The table’s maximum carrying capacity is about 450lbs. 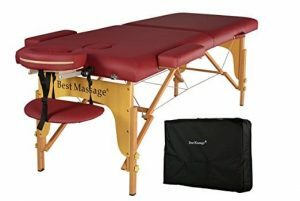 Best Massage has managed to scoop another position, among the top 3 portable massage tables. This particular one comes in burgundy. Its construction was done with Birch Hardwood, contributing to its sturdiness. The legs were also made using double knobs. Not only are they thick, but they are very strong as well. The wire used on it is the same as the one used for an auto brake. The table’s upholstery will definitely impress you. It was a great idea, to use high-density small-cell foam padding. Sierra Comfort has established itself as a leading brand. It is clear from this review list that their massage tables are beyond average. 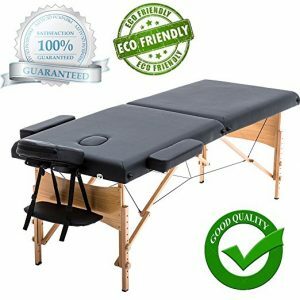 Out of all the portable massage tables we have on this review list, this specific one has surpassed all client expectations. The variety of massage accessories that it comes with, are a definite bonus. It has outlasted most of the competition and will continue to do so. For added strength, the leg of the table has coated tension wires. Aside from the massage table, you will get; Sheets, Semi-circle bolster, carry bag, disposable face sheets, Towel hanger, Oil storage pouch and arm shelf. 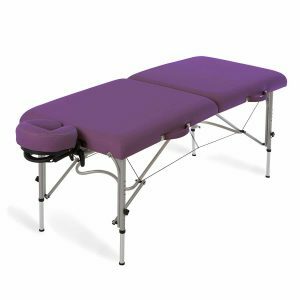 In this review, we have only picked out the best portable massage tables on the market. None of the options listed will fall short of what you need. The varieties here make it possible for you to work with both light and heavier individuals. 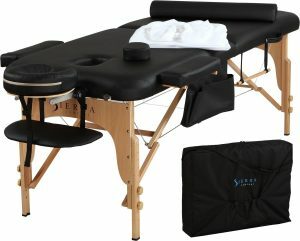 They are also the best portable massage tables because they have been constructed with your safety in mind.